Please attend a community meeting of the SSFL Work Group on March 8 to learn more about the Dept. of Energy’s (DOE) attempts to break its cleanup promises and what we can do to fight this threat to our health and that of our families. A special candlelight vigil held by families impacted by childhood cancer near SSFL will take place prior to the meeting in front of the Simi Valley Cultural Arts Center from 6 – 6:30 p.m. The SSFL Work Group will hold its next meeting on Wednesday, March 16 at 6:30 pm at the Simi Valley Cultural Arts Center in Simi Valley. The Work Group will take a closer look at whether contamination from SSFL migrated to Runkle Ranch and the Brandeis-Bardin Institute and will examine troubles at the state toxics agency (DTSC), which oversees the SSFL cleanup and has come under fire for failing to protect many communities in California. The Work Group will discuss • Proposed permit that would allow more migration of contaminants in surface water runofffrom SSFL • Recent court ruling on disposal of SSFL radioactive debris • Efforts to work with communities that are similarly impacted by the failure of the state toxics department • Cleanup myths propagated by Boeing • And more! 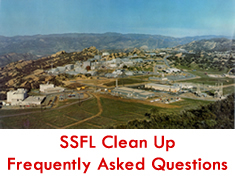 The SSFL Work Group will hold an important meeting on October 1 for a candid discussion about the contamination and cleanup at the Santa Susana Field Laboratory. John Pace, a former Atomics International employee, will relay his first-person experiences during the partial nuclear meltdown of the Sodium Reactor Experiment. Also addressed will be troubling developments regarding the SSFL cleanup agreements that leave some wondering if the nuclear and chemical contamination will ever be cleaned up.